New cutting edge broadband technology is heading to more of London as Openreach gets ready to make its new network available to another 118,500 homes and businesses there. People living in areas including Bowes Park, Kingston, Mile End, South Kensington, Gipsy Hill, Hampton, North Finchley and Walthamstow interested in upgrading their broadband to the new service can see if they’re able to connect by entering their postcode into Openreach’s online fibre checker at openreach.co.uk. Further details for each area are at the end of this news release. They’re among 59 new locations across the UK set to benefit from next generation Gfast broadband technology* being used by Britain’s largest digital network builder. More than 370,000 homes and businesses will be able to order ultrafast broadband in these areas. It’s a further boost for London, which was also announced earlier this year as one of the areas to benefit from Openreach’s biggest ever recruitment of more than 3,500 trainee engineers.Around 580 are being hired across the Capital. 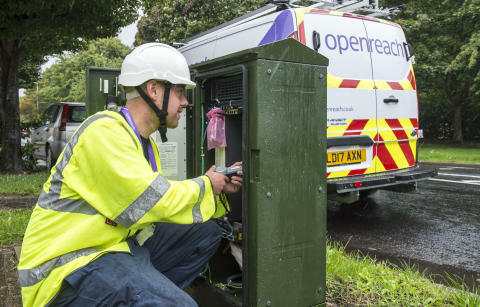 Kim Mears, Openreach’s infrastructure development director, said: “Our engineers have been working across more of London installing cutting edge technology to make faster, more reliable broadband services available. We’re keen for people to check it out and experience the difference an ultrafast connection can make. The latest London rollout is part of a much wider commitment from Openreach, who provide the telephone and broadband network used by the likes of BT, Sky, TalkTalk and Vodafone.